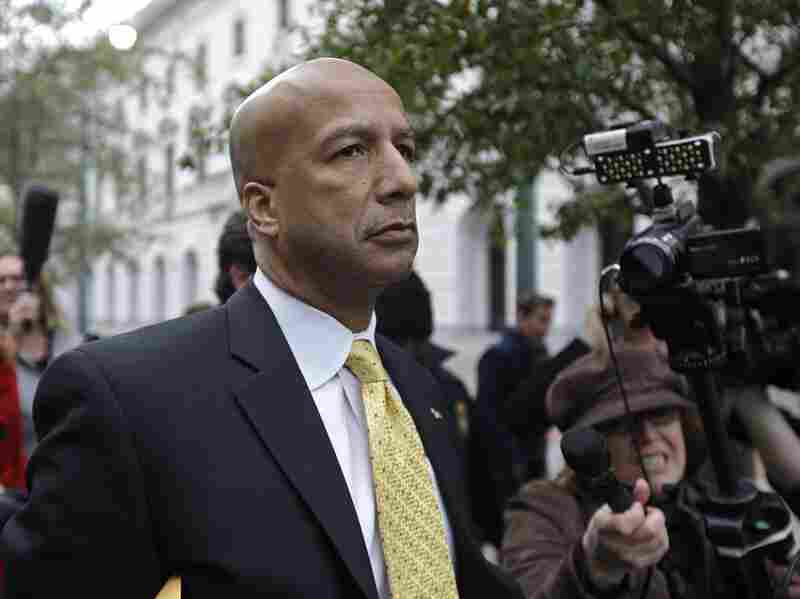 Former New Orleans Mayor Ray Nagin Gets 10 Years In Corruption Case : The Two-Way Nagin, who became the face of New Orleans during Hurricane Katrina, was convicted Feb. 12 of accepting hundreds of thousands of dollars in bribes and kickbacks. Former New Orleans Mayor Ray Nagin leaves federal court after his conviction in New Orleans on Feb. 12. He was sentenced Wednesday to 10 years in prison. Former New Orleans Mayor Ray Nagin was sentenced Wednesday to 10 years in prison for bribery, money laundering and other crimes. He was convicted Feb. 12 of accepting hundreds of thousands of dollars in bribes and kickbacks. The indictment included 21 counts. As NPR's Bill Chappell reported at the time, "Prosecutors also said Nagin accepted perks such as free travel and played a role in funneling money and granite to Stone Age, a company run by his sons. The counts cover a large portion of Nagin's two terms as mayor from 2002-2010, a tenure that included the Hurricane Katrina disaster of 2005." Nagin was indicted in January 2013. At the time, prosecutors said he engaged in bribery, wire fraud, money laundering, conspiracy and filing false tax returns. The FBI, the IRS and New Orleans' inspector general all inspected the case. "Nagin's second term was plagued with allegations of corruption, and frustration over the pace of the Katrina recovery. A number of contractors and one of the mayor's top aides have since either pleaded guilty or been convicted in a series of similar but unrelated bribery schemes." The New Orleans Times-Picayune notes that Nagin faced 20 years in prison, but U.S. District Judge Ginger Berrigan said, "I do intend to downward depart from these guidelines." The newspaper notes the 10 years in prison matches the sentence handed to former Louisiana Gov. Edwin Edwards, who was convicted of corruption in 2000. But it's less than the 13 years handed to former Rep. William Jefferson for his corruption case. Nagin's wife and their children, in letters to the judge, insisted the former mayor was innocent, and called into question the credibility of witnesses called by the prosecution. Nagin is to report to a minimum security lockup in Oakdale, La., on Sept. 8.